How Do I Get Rid of Sand Flies? Sand flies are pesky, blood-sucking, biting insects that are especially common in sandy areas. Also known as horse flies, their bites often leave large, red, itchy bumps. These are usually at least as itchy as mosquito bites, and may turn into a rash. In addition to causing pain and irritation, the flies can also carry and spread a number of diseases. These include leishmaniasis and pappataci fever, which, while not usually deadly, can be quite distressful and unpleasant. However, there are a number of ways to avoid getting bitten altogether. When and Where Do Sand Flies Appear? Sand flies have a relatively short active season. They are usually out and about from June to August, depending on the climate of the region. They are especially prevalent on warm, sunny days when there is little wind, and in warm cities like Dallas, Texas or Jacksonville, Florida. If the temperature drops slightly or there is a short period with stronger breezes, the flies will likely be inactive. 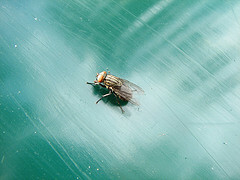 The flies are attracted to shiny surfaces, moving objects, warmth and carbon dioxide. Additionally, light colors usually attract them less than dark ones. Make sure you have screens on your windows to keep sand flies out of your home. If you’re in the habit of leaving your door open for fresh air, you’ll also need a screen door. Dress appropriately when you go to an area where you suspect there might be sand flies. Cover up as much as your body as you can and wear light-colored clothing. Apply bug spray that contains DEET. While this will not eliminate the flies or keep them from breeding, it is the most effective method to keep them off your skin. Be aware that the flies like weeds and tall grass, which provide a cool, moist setting for them to nest. Trim your grass regularly and dispose of weeds in order to discourage this. While you’re at it, you may want to hire a landscaper and give your yard a fresh, new, fly-hostile makeover. Keep a flyswatter around for when sand flies enter your home; flytraps are available as well. Experiment with commonly used yet unproven household remedies for sand flies. These include citrus juice, orange peel, lavender oil, eucalyptus oil, coconut oil, Listerine, Tiger Balm and vinegar. If you fear you have an infestation or the above methods are not working, contact a professional exterminator. They have special chemicals which they can spray as well as traps they can set. What’s more, they have experience locating nests and finding vulnerable entrance points in your home. So instead of just treating your current pests, they’ll prevent more from developing.